Can education be as simple as the GEICO ad? Education, yes! Schooling, no! Two years ago I discovered “The Primal Blueprint“, thanks to Karen De Coster’s article over at LewRockwell.com. I was 50 pounds overweight with aching joints. I decided to go primal because it seemed so easy. It was. I lost the excess weight and started making choices for my life and health. 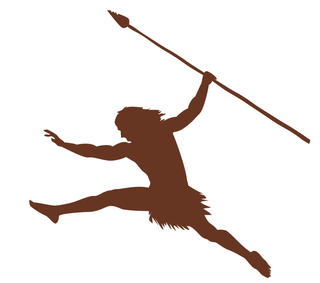 What’s my primal experience got to do with learning like a caveman? Answer: Simple is better. The institutionalized school system was set up to bastardize the learning process. The rules, bells, standardized testing, and structured control, to name a few culprits, are all part the corruption of meaningful learning. Sides are taken on how to reform “education”. What the intellectual reformers miss is so simple. Look to the caveman for the answers. If you assume there wasn’t much to being a hunter-gatherer in pre-agricultural society, you’d be wrong. Young Grok’s survival depended on skills learned from birth. He learned animal tracking, weapon construction and usage, physics, weather patterns, structural engineering, free market economics, plant identification, navigation, medicine, social interaction, music and dance, self-defense for both two and four-legged animals, athletics, art, negotiation, and the list could continue. Grok and his buddies learned this stuff without being schooled. 1. Play. Allowed to play, Grok discovered things about himself as he explored the world around him. Mom and Dad were wise enough to give him all the time and freedom he needed for discovery. This was the surest path to education. My experience with play as a child taught me much about myself and what I enjoy. By age 7, my dad loaded up the family and moved to the country. The nearest neighbor was a mile up the dirt road. My brother and our two best friends spent our daylight hours and some nights in the woods. We explored creeks, caught crayfish, built forts, had BB gun fights, and camped on horseback. We didn’t have video games. We played in real life. 2. Observation. Grok and his friends learned new skills by watching the adults in the tribe. I learned how to shoot, not from cowboys on TV, but by watching my dad and his adult friends while hunting or target practice. Around 10 years old, I showed genuine interest in learning to shoot a shot-gun. Daddy would take me with him to the landfill when it was time to dump a load of trash. He’d throw glass bottles into the air and I learned to bust them with some helpful coaching. I wanted to be as good a shot as my dad. It was not always my dad I learned from. There was people I respected of all ages and backgrounds. Those that were successful at certain skills, I followed if I was interested in learning. 3. Explore. Curiosity and inquiry naturally leads to exploration. As an adult, I’ve become more curious about things I never was interested in growing up. A question pops into my head and I begin my journey of exploration. I’ve always been a serial multitasker. I pursue what interests me. That was not the case for me in school. Subjects were forced on me. I hated history. Now I love it. Why? Because it interests me. I love learning as an adult. School, on the other hand, was brutal. I honestly can’t remember 90 percent of what I was “taught” in school. I’d estimate even less during my college days. The classes I remember learning in were Shop, Art, Physical Education, 4th grade Math, and 6th grade English. I loved to draw, play sports, build stuff, and write. The 4th grade Math class was fun because I learned all my multiplication tables that year. The English class was taught by my aunt. That’s not the only reason I loved that class. Aunt Lucy would send the whole class outside to write or draw. Our class published a poetry book that year. One of my drawings and short stories got included. I still remember the winter scene I drew. I learn best when I really want to learn. I bet the same is true for you. Play, observe, and explore your passions. Discover how easy it is to learn. Fight the urge to think that kids need to be taught. Kids are able to teach themselves if the right environment is provided. If they need or want help, they’ll find it.